* We have the covered big pitch on Sundays from 7 October 2012 onwards. * We have the covered big pitch on Saturdays from 13 October 2012 onwards. The covered pitches are not available on Saturday, 6 October 2012, due to an event. Therefore, we will try the bigger uncovered pitch on that day. There will also no longer be the option of having an extra game from 4 to 5 pm on Sunday on a covered big pitch at Turf City. This is great news Rajiv, well done!! I will make sure that I personally play both days to help numbers stay consistent! But not a Tuesday night game? It seems like there is a big pitch available every Tuesday? If there are enough players, what is the chance of upgrading to the big pitch? A lot of the regulars already have games on Monday and Thursday at Turf City. I don't want to be left struggling to get 18 to 20 players for the uncovered big pitch on Tuesday night, with the risk of rain, when we can start with a covered small pitch, needing only 10 to 12 players. And as I didn't take up the uncovered big pitch last week, I don't know if it is still available. Yes Rajiv there is a good chance I will play Tuesdays also pending factors such as the quality of the game, the price & my fatigue after playing Sat, Sun & Mon. But I am open to it for sure. 10-a-side on the uncovered big pitch works out to 70.4 m2 per player. This is still a lot more than the 60.75m2 per player for our 8-a-sides on the covered big pitch. I think it is not the area per player that determines whether the pitch is crowded or not. This is an average, but players congregate towards the play and hence it will crowded at the attacking end. It is likely the width per midfield player that matters. The midfield is the most congested. Of course, the number of midfielders depend on tactics and how much running each midfielder does. Usually, there are 3 midfielders per team in the 8-a-side match at Turf City covered pitch. The width is 27m. That is 4.50m width per midfielder. For the uncovered pitch, I was not there to witness it but it probably worked out to 4 midfielders per team. That is 32m divided by 8 midfielders = 4m per midfielder. It is hard to move the ball up (whether passing or dribbling) from defence to attack through such a congested midfield. Same for goalmouth action. Taking into account the number of defenders and midfielders defending, and the number of attackers and midfielders attacking, there is not a lot of width to manoeuvre. It would be better to keep it to 8-a-side on the uncovered pitch. The bigger area means a greater emphasis on fitness. It also favours the team which makes better use of the bigger space: more long balls and more running (whether with the ball or off-the-ball). The advantage of an uncovered pitch is that the long ball does not hit the ceiling. Foo Cheong, I've moved your post here. ... the 2 additional uncovered pitches at Turf City are ready. They are 44 m x 32 m in size (1408 m2). For this Saturday only, the game is on the [red]uncovered big pitch[/red]. We've reached 18, so now the question is whether we should go up to 20. For this Saturday's game, I'll add a poll on the "Stand-Alone Polls" sub-board. We've got 20 players plus 2 reserves for today, but only 3 have voted in this poll. I went down for admin purposes. 10-a-side did seem somewhat crowded. Based on the information provided by the Premier Pitch, the uncovered big pitch is about 45% bigger than the covered big pitch, while 4 players more (20 instead of 16) is 25% more. However, the pitch didn't look 45% bigger than the covered big pitch. The same sense of the pitch not feeling as big as the dimensions provided by the Premier Pitch came up when we first started playing at Khalsa. Maybe the Premier Pitch have switched to a shorter metre since they opened up at Khalsa. * 27m for the big covered pitch. * 32m for the uncovered big pitch. That is still 18% wider. The uncovered pitch just didn't seem significantly bigger than the covered pitch. I still think 9-a-side should be the cap though. The field is brand new, there are too much rubber, which cause lots of troubles. 1) The pitch I thought was poor. It may just be a case of getting used to a new/different playing surface but it was to lush, or as Leon said too much rubber. Players were falling over themselves and the ball, you couldn't dribble (... I am talking even simple dribbles and getting the ball out of your feet). I don't see us playing again on an uncovered pitch at Turf City, unless for reasons beyond anyone's control, the covered pitch is again not available. Apart from The Premier Pitch and The Cage, another venue at Turf City is The Rainforest Arena. Chi Kin informed me about the place a few weeks ago, and I checked it out yesterday. * one 50m x 30m - 7-a-side, but according to the person I spoke to, suitable for 8-a-side. * one 47m x 25m - 7-a-side. * one 30m x 20m - 5-a-side, but according to the person I spoke to, suitable for 6-a-side. The pitches are fairly close to the Premier Pitch. If instead of turning left into the Premier Pitch carpark, you turn right, The Rainforest Sports Hub is about 70m away, behind Premier Pitch's uncovered pitches. ... there is an uncovered 7-a-side pitch at Indian Association (further up Balestier Road from Khalsa), run by Kickers Bay. It is cheaper, so it works out to $8 per player. I am keen to try it out. I had a look at the 7-a-side pitch last Saturday. It is smaller than the 7-a-side pitch at Khalsa. Maybe when we finally get round to playing there, we should try 6-a-side, to avoid the problem of over-crowding we had when we first tried the 7-a-side pitch at Khalsa with 8-a-side, and the uncovered 7-a-side pitch at Turf City with 10-a-side. It's about time I started referring to Turf City by its current name - "The Grandstand". All references from today onwards will be to "The Grandstand (formerly known as Turf City)". When everyone is used to the new name, I will drop the words in brackets. * The schedule thread for the game on Saturday, 2 February 2013. * The schedule thread for the game on Sunday, 3 February 2013. This thread will also be renamed. Both games this weekend (yesterday, Saturday, and today, Sunday) ended up 7-a-side. We've had only two 7-a-side game at The Grandstand (formerly Turf City) since 2011, both on the weekend of 16/17 June 2012. All our other games at The Grandstand since the start of 2012 have been 8-a-side. ... I would like to hear views on whether the regulars preferred the seven a side game as opposed to the eight a side. Thoughts? Damian on the WhatsApp group for today's game: "More space, more fun". The price per player remains at $13, whether it is a 7-a-side or 8-a-side, so that is not a factor. For each venue, the price per player is based on the maximum number of players, and applied even if we only have the minimum number. If enough players want to re-open the question of what should be the maximum number of players for a big covered pitch at The Grandstand, I will put up a poll. When we were down to 10 on Saturday, we would have had no choice but to switch to a small pitch. Surprising as it may seem, the last time we switched to a small pitch at The Grandstand because we didn't have enough players was on a Saturday - 4 August 2012. * Big pitch, maximum 16, minimum 14 - $13 per player. * Big pitch, maximum 14, minimum 12 - $15 per player. * Small pitch, maximum 12, minimum 10 - $11 per player. 8-a-side is too crowded. 7-a-side is tiring, but players can simply take turns to be in goal and for longer periods. .... I remember voting for 7-aside as at the time the pitch seemed really cramped when we played 8-aside. What I really think is that it depends on the quality of the players involved. If you have 14 good players then I actually prefer 7-aside. But if you have a "weak link" then it's easier for the other team to take advantage of it. With 8-aside you have more chances to make up for a blunder I think. .... The extra space from having 7 aside allowed you to look up and play football as opposed to always battling for the ball.. its strange how much 2 less players can make a difference in terms of space and the quality of football. I would def vote 7 a side on that pitch - but agree, it means more running (especially for the centre mid as the lack of 3rd defender means the centre mid has to be a typical box to box midfielder, at least more than normal. Having played 2 7 a-side games this week, I can now appreciate the difference between 7 and 8 a-side games. The tempo of the game is much slower as players have more time and space on the ball. The key roles are 1 center midfielder who can run all day and a forward who can hold the ball and wait for the calavry to arrive. I have to say that 7-a-side occasionally is kinda fun but fitness level requires a different kind....was so winded yesterday! With 8-a-side, one can just play in his or her position without too much overlapping as every part of the pitch is packed, but with just 2 men off the pitch, what a difference....instead of a left/right back, we now have to play as wingbacks! More fun though!! The Premier Pitch @ The Grandstand has just informed me that it has revised its package, so I can reduce the payment per player from $13 per player to $12 per player with effect from next weekend. The ground was damp at one end where the rain came in, resulting in a few slips. Although the pitches at Turf City are covered, when it rains heavily, the areas close to the goal-lines and side-lines can get wet and slippery. .... Therefore, it is advisable to use all-weather astro shoes even at Turf City, instead of flat soles. I suppose we can consider switching ends halfway through the game for games at The Grandstand, especially during heavy rain. Although seldom commented upon, on a sunny day, sunlight streams in on one end of the big pitch, and the glare does affect the game. The glare usually eases off by the second half of the game, so switching ends doesn't really address the problem. If anyone has any other suggestions, add them below. The issue was addressed on the "Making time to play & punctuality" thread on 14 November 2011 and on this thread in May 2012, and I used to include a reminder regularly for the games at The Grandstand, at least from November 2011 until February 2013. Nowadays, I just settle for a reminder on the message board and/or the WhatsApp group chat for everyone to be early. We will be upgrading our pitches to continue to give you the best football playing surfaces that are available in Singapore. 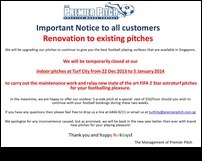 We will be temporarily closed at our indoor pitches at Turf City from 22 Dec 2013 to 5 January 2014 to carry out the maintenance work and relay new state of the art FIFA 2 Star astroturf pitches for your footballing pleasure. I have booked slots at the Rainforest Sports Hub instead for that period. It will be $11 per player. Good chance to finally try out the Rainforest Sports Hub. It is uncovered, so the weather will be a factor though. After several failed attempts to try out the Rainforest Sports Hub, we have 19 for the game tomorrow. rajiv, is there a 8/9 a-side pitch available? I originally booked the 47m x 25m pitch, but with so many players, I've switched the booking to a 50m x 30m pitch. Even assuming the dimensions provided are unreliable, I think we can go up to 9-a-side. Previously, we found 10-a-side on a 44m x 32m pitch was far too crowded. 9-a-side on a 50m x 30m pitch should be ok.
We finally tried out Rainforest Sports Hub on Saturday (28 December 2013). Some concerns on the WhatsApp group chat on playing 9-a-side, and anyway, we don't have enough for a 9-a-side so I've switched back to the 47m x 25m pitch (Pitch D). ..... It was an interesting pitch which was short lengthwise but wide. With 8 players a side, this meant that there wasn't much space to build an attack, hence the low scores. The dimensions given to me by the Premier Pitch for their uncovered pitches is 44m x 32m. For the covered pitch, what I have been given is 36m x 27m. The game today (Sunday) was cancelled due to insufficient numbers. As I pointed out on the WhatsApp group chat before the game last Saturday, the dimensions given to me are hardly accurate. It really depends on who did the measuring (and perhaps how even!). Premier Pitch's uncovered pitches are clearly the widest, which should promote passing over the long ball game. I don't see us using the Rainforest Sports Hub again before the second half of this year. * PPC - Covered pitches at the Premier Pitch. * PPU - Uncovered pitches at the Premier Pitch. * RFSH - Rainforest Sports Hub. I arranged to pay for 2 games at the uncovered pitch at the Premier Pitch this weekend. As the games at the Premier Pitch today and tomorrow have been cancelled, even though the covered pitches have re-opened, I will use the second booking for next Saturday.